We’re having a baby this month. It’s amazing how different things are for a third baby as opposed to the first one, at least for me. No longer is it a dreamy bubble of new mama bliss. No sweet baby showers and therefore no stash of diapers, onesies, blankets. Little to no home prep for baby instead of beautifully themed nurseries. No, instead the baby’s room isn’t because they have two big siblings who already share it. Their tiny newborn clothes are a little stained and maybe not even washed. Four weeks until baby’s due date and there’s nowhere for him or her to sleep yet, my hospital bag’s not packed, and no freezer meals made. The only thing that is ready is a new to us changing table set up in our room. No changing pad on it yet, but the table’s there. I know babies don’t need much, but dude… they need clean clothes. I’ll get there. There’s a laundry list, friends, so many things I haven’t mentioned in full. It’s a fine line to walk between gratitude and misery. Crossing one into the other feels like a betrayal. I feel like I’m unable to have one without the other: if I’m miserable, I’m not grateful, and if I’m grateful, my misery doesn’t count. But I figure someone will google their symptoms and I hope they land here for a kindred spirit. Symphysis Pubis Dysfunction (SPD): Due to the relaxin hormone raging through my body, my pubic bones don’t fit together properly, causing intense pain when doing crazy things like getting out of bed or a car, putting on pants, stepping over the dog, going up stairs, sitting, standing, laying down… and now the relaxin is really having a party in my body. It’s causing my ribs to dislocate and the nerves running between them to freak out. My shoulder blade, right side of ribcage, and neck feel like they’re on fire constantly, making breathing, coughing, sleeping, moving at all difficult and painful. Which is super encouraging for labor. I’m restricted from lifting my arm above my shoulder and from picking up my kids 🙁 For treatment of both my pubic bones and now my ribs, I’m seeing a chiropractor a couple times a week, a physical therapist, icing, and a husband who is taking much of the brunt of the homefront duties. Pica, caused by iron deficiency: Basically my body has never made enough iron, and it dips super low when I’m pregnant. A normal range is 12-15, and I sit around a 9 when pregnant. And since my body is craving iron, it thinks it’s craving all kinds of other weird things (that’s the Pica) I eat ice like it’s going out of style, and kind of want to slurp down laundry detergent. But I just stick with the ice. Semi-permanent stuffy nose: Again, thanks to hormones that think they have to increase my mucus production for delivery, my nose is a-flowing. Which is really convenient and comfortable with dislocated ribs. Bladder infections: I’ve had three this pregnancy, so now I’ll be on antibiotics for the remainder to prevent the infection from a) entering my kidneys, and b) causing preterm labor. Braxton Hicks contractions: These ‘false’ or ‘practice’ contractions are strong and long enough to take my breath away. The day my ribs started fighting back I did have false labor, contractions every 8-10 minutes for hours until I drank a gallon of water and cried my way through laying down. There are more, minor things but I needed to share these out loud, for those who also suffer in the midst of their gratitude. It’s a very real thing, a tangible struggle to fight for the joy while there is pain. I’m learning that gratefulness + suffering can co-exist – maybe not peacefully, but possibly. Starting weekly appointments today!! And we’ll also have a 36-week ultrasound today. Can’t wait to see this little baby’s face again. All the time! I love it. Baby seems to be staying head down (however, my OB said the head is resting on my pubic bone instead of nicely in my pelvis) and moving around like a champ. Sam has gotten to feel baby moving and he loves it. There’s nothing like watching wonder on a three-year-olds face. My favorite from Halloween =) Only 4-ish weeks to go. I can’t believe it and I’m so excited to meet this little tiny new person! Oh friend, I’m so sorry you are in so much pain. Praying. Thank you, my faithful friend. Oh my goodness…you maybe in pain (which I hate) but you are absolutely adorable in that Halloween costume!! Awww, thanks Bobi Ann! 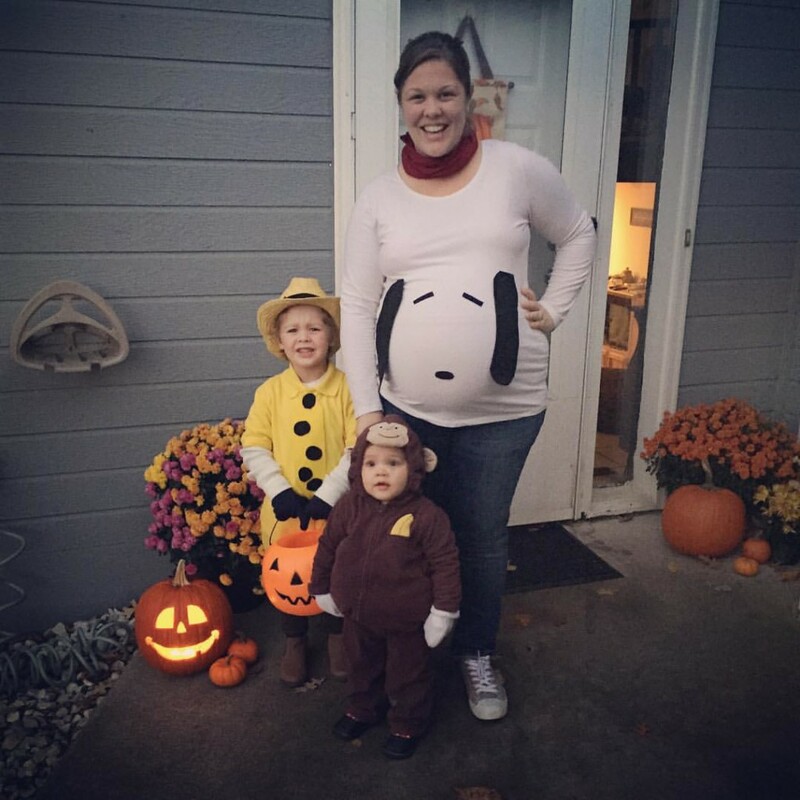 It was really fun to surprise my kids with – they love Snoopy!! Hi, I just happened upon your site and I really admire it. I tried clicking your contact email link because I had a few questions, but it couldn’t work for some reason. My email is on a site I just created about recovering from OCD/living life/having adventures, which is facefearsnlive.wordpress.com. I’d really appreciate and enjoy speaking with you. Thanks!